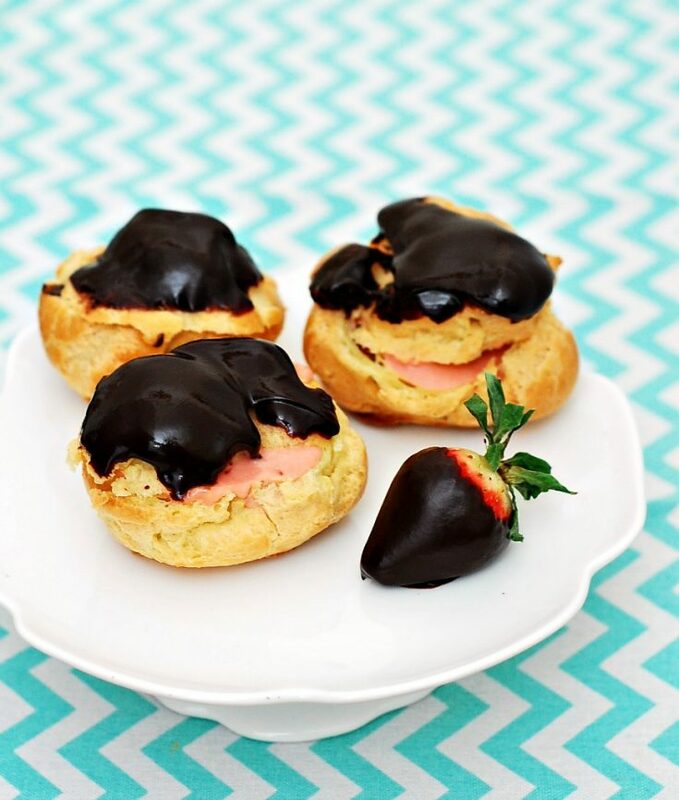 I’m celebrating Galentine’s Day with this take on chocolate-covered strawberries: cream puffs filled with strawberry pastry cream and drizzled in chocolate. Happy Galentine’s Day! What is Galentine’s Day, you ask? It’s a fictional celebration from the television show “Parks and Recreation.” It’s the best day of the year. Celebrated on February 13th, women leave their husbands and their boyfriends at home and just celebrate each other over breakfast. “Ladies celebrating ladies,” as Leslie Knope said. True, these cream puffs aren’t “breakfast food.” But I’m a firm believer that every meal needs dessert, especially when celebrating something special, like Galentine’s Day. These palm-sized cream puffs are filled with strawberry-flavored pastry cream, and drizzled with chocolate ganache. They’re like chocolate-covered strawberries, only better. I made these in celebration of all the women in my life. There have been many women in my life that are inspirational to me. My paternal grandmother graduated as valedictorian of her high school class, and later went on to raise four children on her own at a time when divorce was not as common as it is now. My maternal grandmother emigrated to this country with very little in the way of a support system. 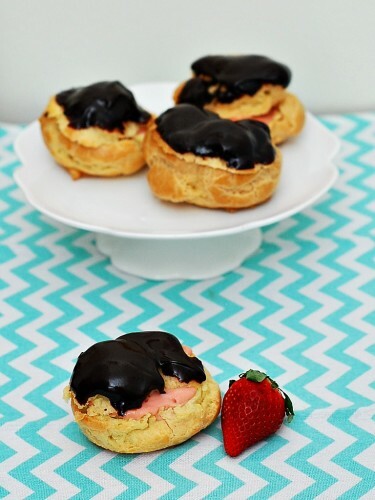 Both of my grandmothers were fond of cream puffs, and I like to think they would be over the moon for these chocolate covered strawberry cream puffs. Place the heavy whipping cream, 2 tbsp of the sugar and the salt in a medium saucepan. Place over medium-low heat. When you begin to see steam rising from the saucepan, begin vigorously whisking the egg yolks with the remaining 2 tbsp of sugar and the cornstarch until the mixture turns light yellow in color. When you see bubbles begin to form around the edges of the saucepan, temper the hot cream with the egg yolks: *very* slowly begin pouring the hot cream over the egg yolks, whisking constantly. Once you've poured about a third of the cream over the yolks, pour the yolk mixture back into the saucepan. Set over medium heat and cook, stirring constantly with a silicone whisk or wooden spoon until thickened (about a minute). Pour the pastry cream through a fine-mesh strainer into a storage container. Whisk in the butter, vanilla and strawberry puree (and the food color, if using). Whisk until fully combined. Place a sheet of plastic wrap directly on the surface and chill overnight. Place the water, butter and salt in a medium saucepan over high heat until the butter melts and the mixture comes to a full rolling boil. Remove the saucepan from the heat and add the flour all at once. Stir with a spoon or spatula until all of the water is absorbed. Return the saucepan to the burner over medium heat, stirring for about a minute or two. When touched, the mixture should feel greasy but not wet. The mixture may leave a film on the bottom of the saucepan. Transfer the mixture to the bowl of a stand mixer and let cool for 5 to 10 minutes. Preheat the oven to 425 degrees. Line a sheet pan with parchment paper. Begin adding the egg yolks, one at a time, beating until fully incorporated before adding the next. Scrape down the bowl between each addition. The mixture may look curdled, but by the time the last yolk is added, the mixture will come together. Use a muffin scoop to portion the dough, spacing each ball 3 inches apart. Bake for 10 minutes, or until fully puffed. Reduce the oven temperature to 350 degrees, and bake another 20 minutes, until golden brown on the top. Remove from the oven and place on a wire cooling rack. Puffs may deflate somewhat but still keep their shape. Transfer the pastry cream to a pastry bag fitted with a medium plain or star tip. Poke the tip into the bottom of each puff, and fill with some of the pastry cream. Make the ganache: place the chopped chocolate in a clean, dry heatproof bowl. Scald the heavy cream over medium-low heat. Pour the hot cream over the chocolate and let sit one minute, then whisk until uniform in texture. You can dip the tops of each cream puff in the ganache, or transfer the ganache to a glass measuring cup and pour over the cream puffs. 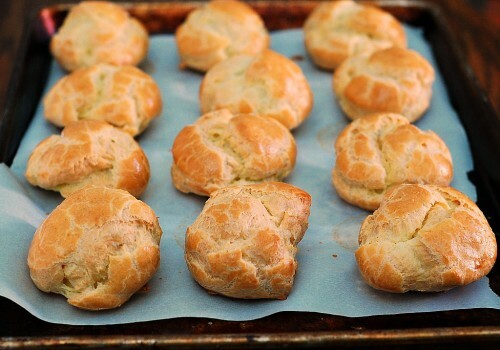 Refrigerate the cream puffs until ready to serve. Don’t forget to check out these fabulous Galentine’s Day recipes! You just made cream puffs SO much better! Chocolate and strawberries together in that pillowy crust is genius. Thanks for joining in the party today! I’m game to eat these delectable cream puffs for breakfast! I’m happy to be celebrating Galentine’s Day with you! That strawberry filling makes these so special! I love the idea of strawberry filling in these. They’re so pretty! thee look the perfect way to celebrate galentines day! Hooray for amazing grandmas! I’m so enamored of this strawberry filling, I can just imagine biting through the puff and landing in that…mmmmm…. I have to watch parks and rec! I’ve only caught a few episodes, and it’s next on my list to binge watch off Net Flix. These cream puffs looks amazing too! I love the Galentine’s day thing. I watch Parks and Rec 🙂 What a great dessert to celebrate such an occasion! Isn’t it incredible how hard life was for our grandparents? They overcame so much and succeeded in the face of what seemed like insurmountable difficulties. I sure as hell know I couldn’t live through what they did! These cream puffs are perfect for honouring your amazing grandmothers – they’re beautiful and I love that you filled them with strawberry cream. Happy Galentine’s Day! 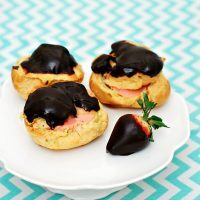 I LOVE cream puffs but I normally fill with either vanilla pastry cream or a mocha mousse I definitely need to try these strawberry filled ones. I know my daughters will love. You had me at creampuffs – one of my favorite desserts EVER!!! I LOVE that you celebrated Galentine’s Day. 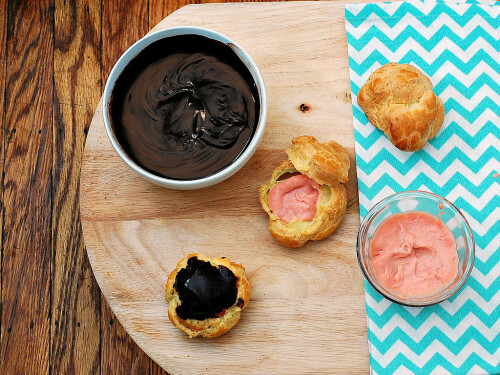 These puffs are stuffed with my two favorite flavors – strawberry and chocolate. Yum! What a pretty and unexpected twist on a classic cream puff! Perfect for Valentine’s Day! I’m such a sucker for cream puffs and absolutely love that yours are covered in chocolate – delicious! I can’t even imagine bringing up a child alone today, much less four children several decades ago. I love that you made your grandmas something they would have liked. 🙂 And I would love these cream puffs, too! If donuts can be breakfast food, then cream puffs can totally be breakfast food! I love these! Happy Valentine’s Day! These look great..I have never had a cream puff with strawberry filling! Yummy! Happy Belated Galentine’s Day!!! Love these dipped in chocolate ooo and the strawberry with it is perfect!